Santhana Lakshmi is one of the forms of Ashta Lakshmi. She is the one who bestows offspring. She is often depicted as having six arms. Santhana Lakshmi carries two kalashas in her two hands. Her other two hands hold a sword and shield. The remaining hands hold the child who is seen on her lap and her other hand gestures abhaya mudra. 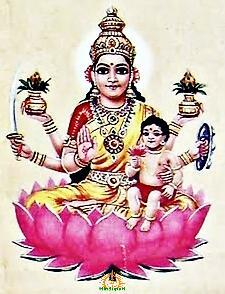 The child in her lap is holding a lotus. Santhana Lakshmi is the Goddess of fertility. She grants health and intelligence among children and protects the infants from all diseases. She is considered a very important Lakshmi because children are amongst the biggest wealth for a human being. After all, whatever a human does in his life is mostly for the next generation. Any person blessed with good children will have a good life to live and hence the worship of Santana Lakshmi is important. The one who is riding on a Garuda holding chakra in your hand and enchanting the world of gnana. The one who is worshipped by the seven swaras of music and quenches our attachments to worldly things, Who is the assembly of all auspicious attributes with sacred feet worshipped by all devas, sages and humans. Victory to Santhana Lakshmi, The beloved one of Madhusudhana Protect me forever.